‘We are struggling to meet the levels of demand… we feel “rushed off our feet”… we realise we’re only scratching the surface of need.’ These comments from the service featured in this month’s cover story (page 8) will ring true with so many of you. Coming from experienced workers at a community alcohol service, they should strike a note of panic with those planning the new public health landscape. 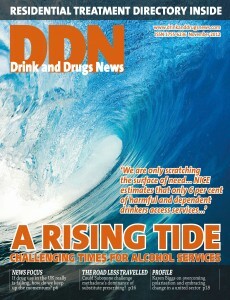 With the rise and rise of risky drinking and parallel increase in alcohol-related diseases, there’s a burgeoning demand on resources at both ends of the spectrum, from prevention and early intervention work to end-of-life care – a trend that runs completely at odds with the chronic underfunding of alcohol services. Will Public Health England (PHE) listen to the expertise of specialists in this field? Its head, Duncan Selbie, (page 12) says he is looking forward to doing just that and making sure policy is evidence based. When PHE launches in the spring we’ll see how responsive his organisation turns out to be to the stark evidence under its nose. We know life’s tough out there at the moment. This is our eighth anniversary issue and during that time we’ve seen the treatment landscape change beyond recognition. Let’s hope our sector’s expertise takes its place alongside value for money in the new Public Health England. More people are successfully completing treatment, says the NTA. What’s behind the trends, and can they be maintained, asks DDN. Rising demand, increasing bureaucracy and a client group with complex needs are just some of the challenges facing alcohol services. Hazel Jordan offers a frontline perspective. With a bill on compulsory drug and alcohol education going through Parliament, a new Adfam briefing looks at the role that education can play in prevention. DDN reports. The first City Health conference set the scene for planting drug and alcohol treatment at the heart of the new public health agenda. DDN reports. Methadone’s dominance over Suboxone in substitute prescribing may have more to do with cost than effectiveness. It could be time for a reassessment, say Neil McKeganey, Christopher Russell and Lucy Cockayne. With its Voyage of Recovery just completed, David Gilliver talks to Phoenix Futures chief executive Karen Biggs about overcoming polarisation and embracing change. A Calderdale-based service is combining treatment provision with hosting an emerging recovery community. Michelle Foster explains the ‘warrior down’ concept.